Torrey Pines balloon aerial survey photo. 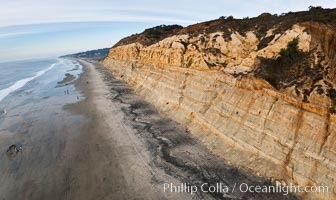 Torrey Pines seacliffs, rising up to 300 feet above the ocean, stretch from Del Mar to La Jolla. On the mesa atop the bluffs are found Torrey pine trees, one of the rare species of pines in the world. Peregine falcons nest at the edge of the cliffs. This photo was made as part of an experimental balloon aerial photographic survey flight over Torrey Pines State Reserve, by permission of Torrey Pines State Reserve. Balloon Aerial Survey Photo. Torrey Pines balloon aerial survey photo. 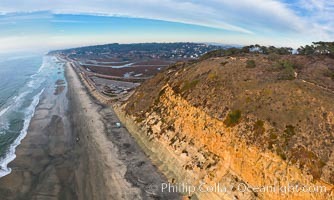 Torrey Pines seacliffs, rising up to 300 feet above the ocean, stretch from Del Mar to La Jolla. On the mesa atop the bluffs are found Torrey pine trees, one of the rare species of pines in the world. Peregine falcons nest at the edge of the cliffs. This photo was made as part of an experimental balloon aerial photographic survey flight over Torrey Pines State Reserve, by permission of Torrey Pines State Reserve. Balloon Aerial Survey Picture. Torrey Pines balloon aerial survey photo. 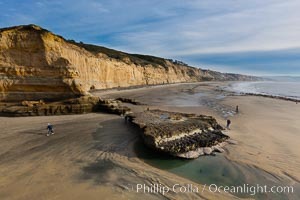 Torrey Pines seacliffs, rising up to 300 feet above the ocean, stretch from Del Mar to La Jolla. On the mesa atop the bluffs are found Torrey pine trees, one of the rare species of pines in the world. Peregine falcons nest at the edge of the cliffs. 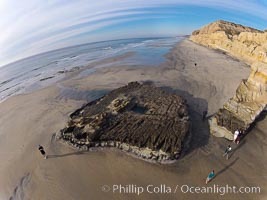 This photo was made as part of an experimental balloon aerial photographic survey flight over Torrey Pines State Reserve, by permission of Torrey Pines State Reserve. Stock Photography of Balloon Aerial Survey. Torrey Pines balloon aerial survey photo. 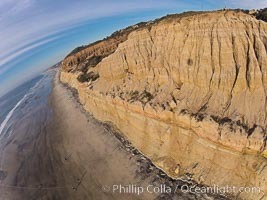 Torrey Pines seacliffs, rising up to 300 feet above the ocean, stretch from Del Mar to La Jolla. On the mesa atop the bluffs are found Torrey pine trees, one of the rare species of pines in the world. Peregine falcons nest at the edge of the cliffs. This photo was made as part of an experimental balloon aerial photographic survey flight over Torrey Pines State Reserve, by permission of Torrey Pines State Reserve. Photograph of Balloon Aerial Survey. 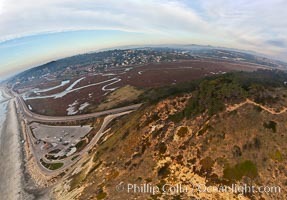 Torrey Pines balloon aerial survey photo. 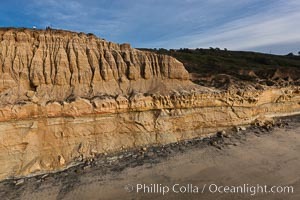 Torrey Pines seacliffs, rising up to 300 feet above the ocean, stretch from Del Mar to La Jolla. On the mesa atop the bluffs are found Torrey pine trees, one of the rare species of pines in the world. Peregine falcons nest at the edge of the cliffs. 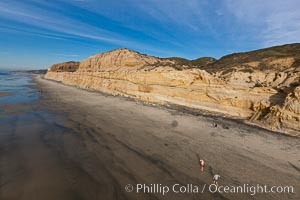 This photo was made as part of an experimental balloon aerial photographic survey flight over Torrey Pines State Reserve, by permission of Torrey Pines State Reserve. Balloon Aerial Survey Photos. Torrey Pines balloon aerial survey photo. 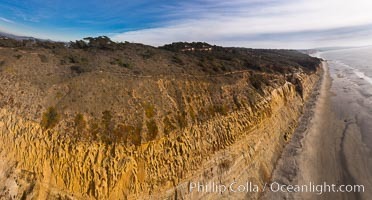 Torrey Pines seacliffs, rising up to 300 feet above the ocean, stretch from Del Mar to La Jolla. On the mesa atop the bluffs are found Torrey pine trees, one of the rare species of pines in the world. Peregine falcons nest at the edge of the cliffs. This photo was made as part of an experimental balloon aerial photographic survey flight over Torrey Pines State Reserve, by permission of Torrey Pines State Reserve. Balloon Aerial Survey Image. Torrey Pines balloon aerial survey photo. 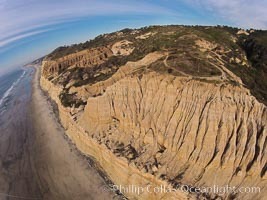 Torrey Pines seacliffs, rising up to 300 feet above the ocean, stretch from Del Mar to La Jolla. On the mesa atop the bluffs are found Torrey pine trees, one of the rare species of pines in the world. Peregine falcons nest at the edge of the cliffs. This photo was made as part of an experimental balloon aerial photographic survey flight over Torrey Pines State Reserve, by permission of Torrey Pines State Reserve. Professional stock photos of Balloon Aerial Survey. Torrey Pines balloon aerial survey photo. 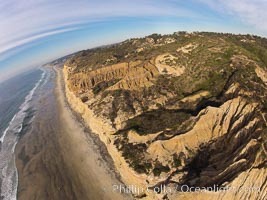 Torrey Pines seacliffs, rising up to 300 feet above the ocean, stretch from Del Mar to La Jolla. On the mesa atop the bluffs are found Torrey pine trees, one of the rare species of pines in the world. Peregine falcons nest at the edge of the cliffs. 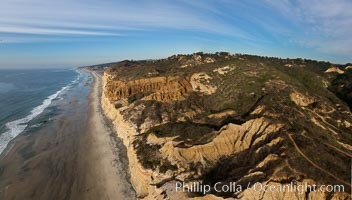 This photo was made as part of an experimental balloon aerial photographic survey flight over Torrey Pines State Reserve, by permission of Torrey Pines State Reserve. Pictures of Balloon Aerial Survey.